Sydney, 7 November 2018 – Recently UTS, the Australian Rugby Union (ARU) and the Sydney Cricket & Sports Ground Trust (SCG Trust), came together in an exciting partnership to develop the new Rugby Australia Building at the Moore Park sporting precinct in Sydney. Part of the fit-out of this state-of-the-art new facility included a Skills Acquisition and Motor Learning Lab – a testing facility specifically for invasion games such as football, rugby and basketball. The brief for the audiovisual system in this space was to deliver a large screen that displays life-like images and videos while also being able to absorb impact from balls being projected towards and to bring all of this together they chose a Sony VPL-FHZ120L projector. 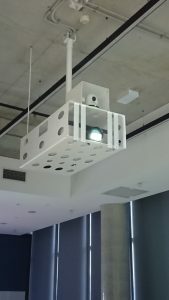 To select the most suitable projector for the space, Alex and his team organised a comparison and evaluation of several high-brightness projectors. The comparison took place in the actual space where the projector was to be installed. The team at UTS use the new Sony projector connected to a laptop. They are a diverse bunch including researchers and teachers in sport and exercise science, from UTS’s Faculty of Health, all of whom display virtual playing fields from various ball sports on the custom screen. Students or players then shoot balls against the screen and camera measures how precise their aim is against the target being displayed. With that said, clever outside-the-box thinking by the UTS team delivered the concept of custom-made gym padding as a projection surface. 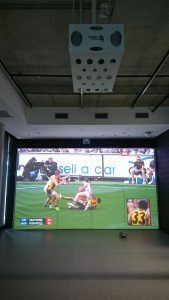 The sport and exercise scientists in the Moore Park facility have reached out to several stakeholders within the Australian sports scene, and everyone who has visited the space has been impressed with the size of the custom screen and picture quality of the new Sony VPL-FHZ120L projector.